Front-running Republican Presidential candidate Donald Trump has a decidedly mixed record on the Second Amendment. Though a concealed carrier in New York since the 1980s, he has in the past supported universal background checks, waiting periods, and gun bans. Trump’s “Protecting Our Second Amendment Rights Will Make America Great Again” position paper was clearly designed to address this issue head-on, and in so doing, he has driven the mainstream media and their leftist allies around the bend. Those “extreme fantasies” apparently include viewing the Second Amendment in precisely the same manner as the Founding Fathers did. Emily Atkin of Think Progress—where neither actual thinking nor actual progress are encouraged—likens Trump’s platform to a machine gun in every pot. Donald Trump imagines a world where regular citizens can buy automatic weapons; where gun owners can hide their weapons in any state; where there are no expanded background checks for gun purchases; and where citizens fight crime with their own assault rifles. She then went on to attack the most politically-mature and fully formed part of his position paper, inaccurately. A few parts of Trump’s statement focus on concealed carry, or the right for gun owners to walk around in public with their weapons hidden. He advocated for a federal law that mimicks a driver’s license — in other words, if you get a concealed carry permit in one state, it should be enforceable in other states. 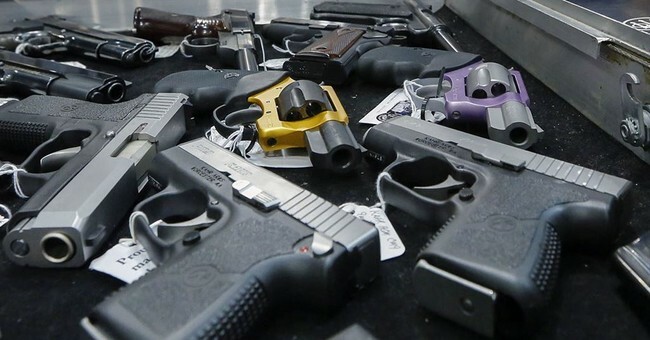 Currently, there is no federal law addressing this — though all 50 states allow concealed carry with some type of permit, each permit has different terms, and is only enforceable in the state in which it was given. Any nearly everyone with a concealed carry permit already knows, Atkin’s assertion that permits are only good in the states in which they are issued is laughably false. Most states that grant concealed permits have reciprocity agreements with many other states. My North Carolina concealed carry permit, for example, is recognized by 36 states beyond North Carolina’s borders. Trump’s plan echoes a national reciprocity bill that already exists, and which would appear to have the votes to pass in the House and Senate and be signed into law… if we elect a pro-gun President and retain or expand Republican control of Congress. Despite having some good ideas, Trump’s overall position paper on guns is a lot like the candidate himself; half-baked, and full of empty promises without any detail of how to make things actually, you know, work. There is plenty of room to hammer Trump’s empty rhetoric on mental health care and “fixing” background checks, if critics wanted to press him to flesh out these proposals. Small government conservatives should likewise have a problem with his ideas on re-implementing a problem-filled, big-government solution like Project Exile. Amusingly, the media isn’t targeting these empty ideas. They’re instead playing to the more defensible parts of Trump’s overall position on firearms. They’re making the mistake of once again confusing their biases for Trump’s actual weaknesses.